This is the companion page to the Goofy page I posted Monday! It is also a sketch from the Big Picture Class I took! Sketch Number 6 in fact! 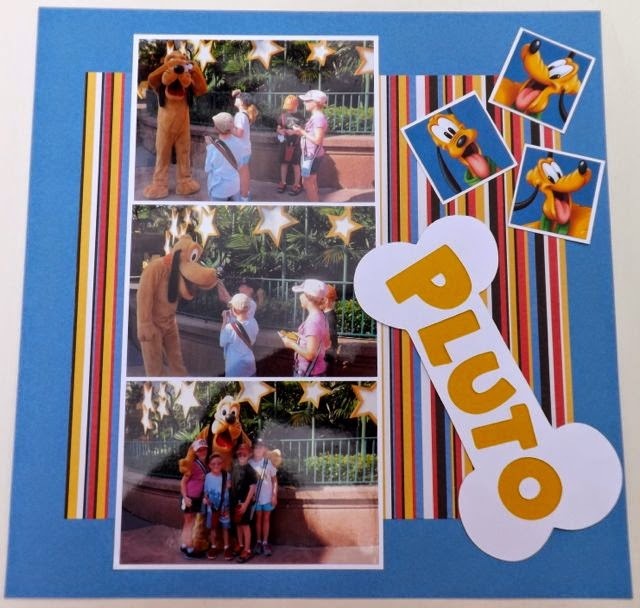 The cute Pluto title is from the Mickey Font Cricut Cartridge! It was just push a key and cut and I put Honey behind the white to make the name POP! The pictures of Pluto at the top right were cut from a sheet of paper and matted! Easiest and cheap embellishment but worked great for this page! Again this was a simple layout but is very graphic in nature so it really emphasizes the picture not the art! I love this and the fact that it was Fast and Easy! Keep checking back! There is some sneak peeks of new products coming soon!